26 CEF sectors out of 31 positive on price and 28 out of 31 sectors positive on NAV. Senior loan funds gain +1.56% in premium last week. NBB tender oversubscribed with 54% pro-ration. This article was first released to subscribers 2 weeks ago. 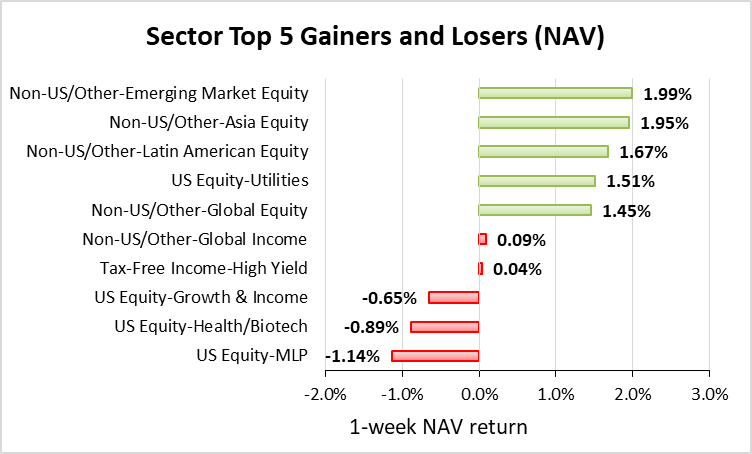 The Weekly Closed-End Fund Roundup will be put out at the start of each week to summarize recent price movements in closed-end fund (CEF) sectors in the last week, as well as to highlight recently concluded or upcoming corporate actions on CEFs, such as tender offers. Most of the information has been sourced from CEFInsight or the Closed-End Fund Center. I will also link to some articles from Seeking Alpha that I have found for useful reading over the past week. The searchable tag for this feature is "cildoc." Data are taken from the close of Friday, February 22, 2019. 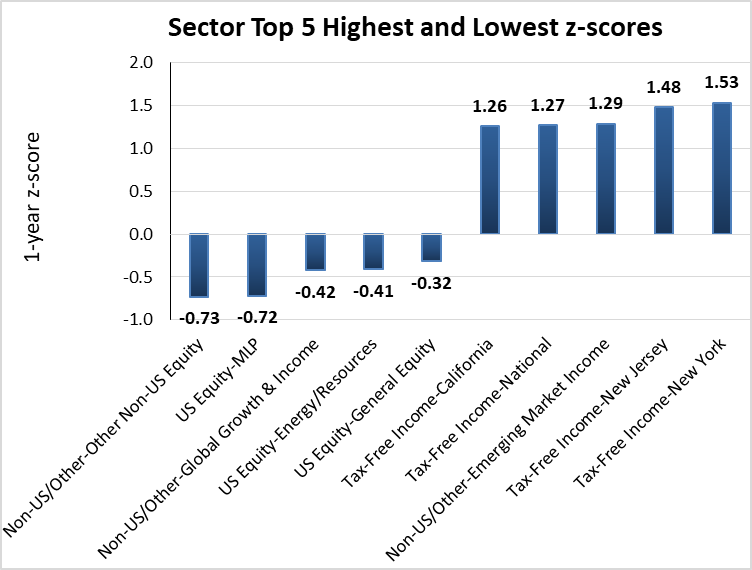 26 out of 31 sectors were positive on price (unchanged from last week) and the average price return was +0.59% (up from +0.44% last week). 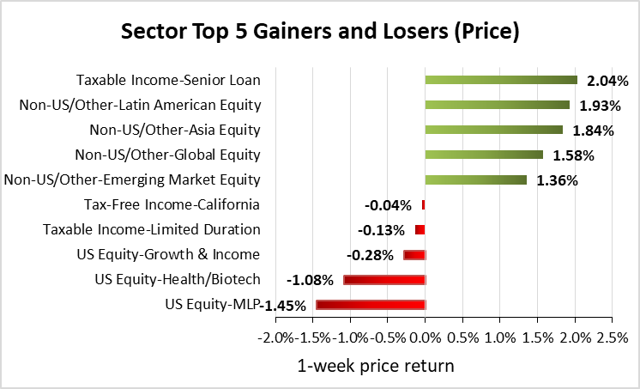 Four out of five leading sectors were international or global equity CEFs, with the exception of the leading sector, senior loans at +2.04%. Underlying performance was also exceedingly strong. 28 out of 31 sectors were positive on NAV (up from 19 last week), while the average NAV return was +0.47% (down from +0.78% last week). However, interestingly the senior loan sector gained only +0.39% by NAV this week, suggesting that most of the price return was due to discount contraction. 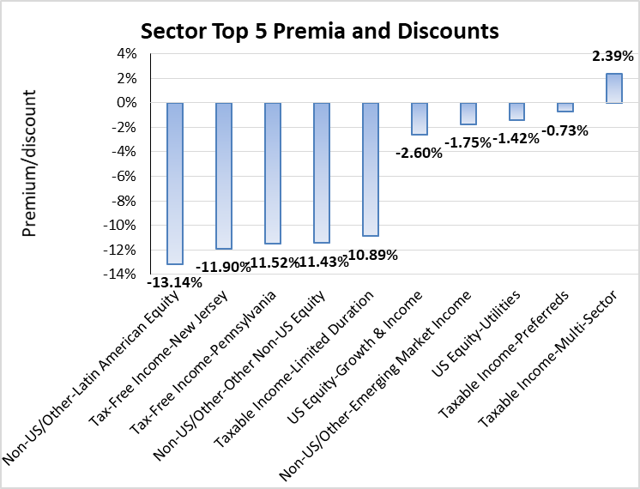 The sector with the highest premium is multisector income (+2.39%), while the sector with the highest discount is Latin America equity (-13.14%). 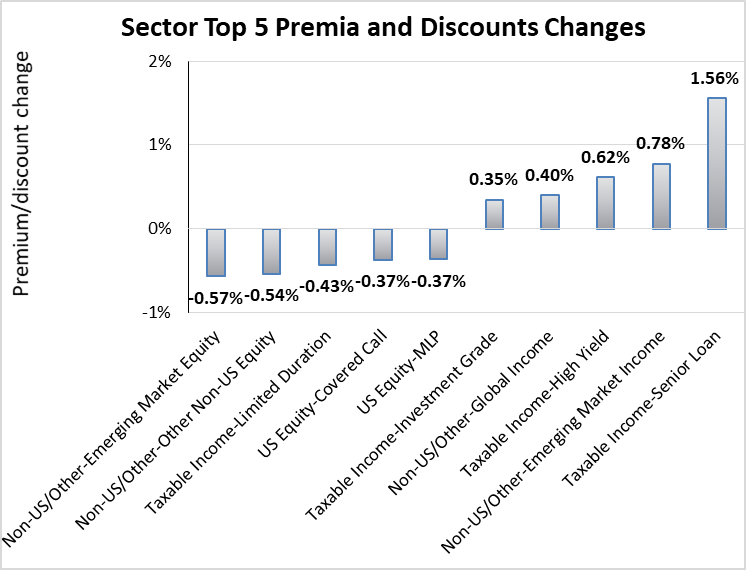 The average sector discount is -6.61% (up from -6.74% last week). Senior loan showed the largest premium/discount increase (+1.56%), while emerging market equity showed the largest premium/discount decline (-0.57%). 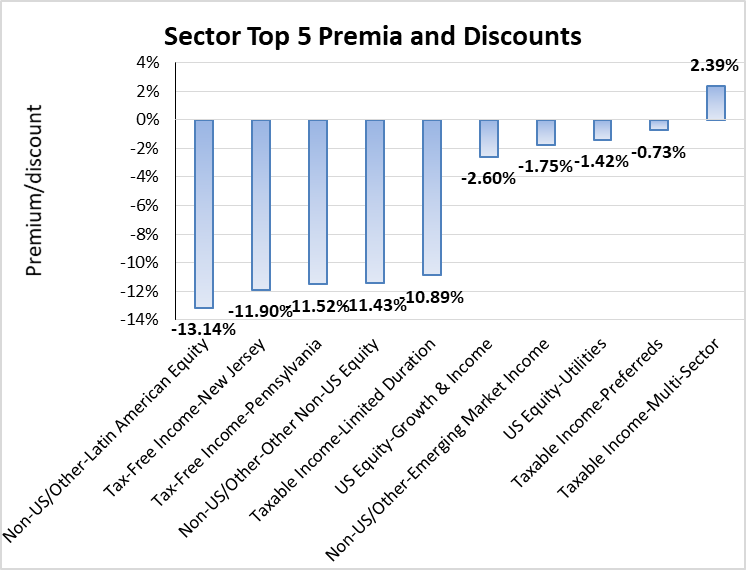 The average change in premium/discount was +0.11% (down from +0.33% last week). 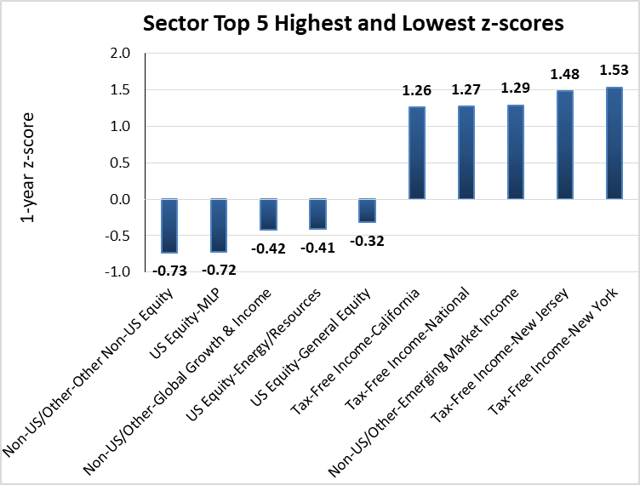 The sector with the highest average 1-year z-score is New York munis (+1.53) while the sector with the lowest z-score is other non-U.S. equity (-0.73). The average z-score is +0.40 (up from +0.37 last week). The sector with the highest yields are MLPs (11.02%), global equity income (9.82%), emerging market income (9.16%), global growth & income (9.09%) and multi sector income (8.88%). 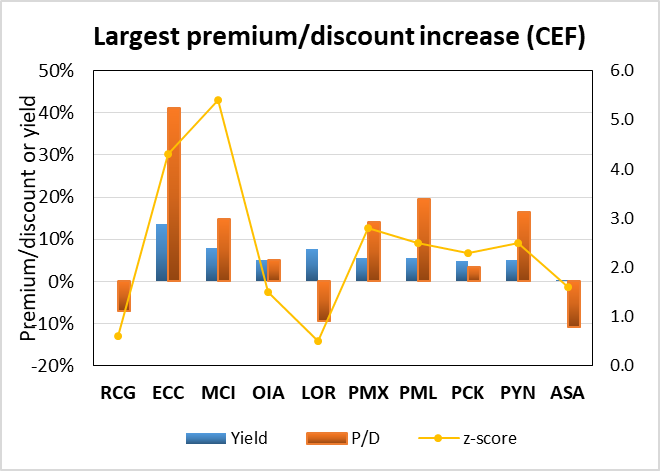 Discounts and z-scores for the sectors are included for comparison. 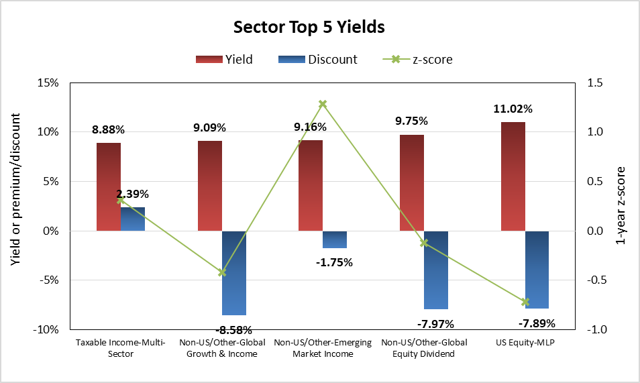 The average sector yield is 7.09% (down from 7.16% last week). 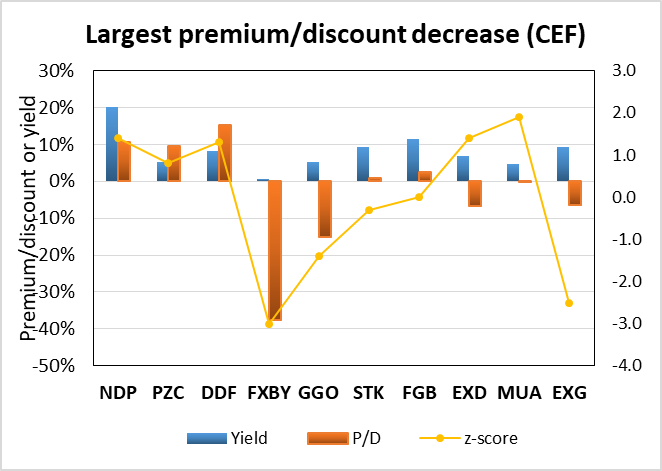 Individual CEFs that have undergone a significant decrease in premium/discount value over the past week, coupled optionally with an increasing NAV trend, a negative z-score, and/or are trading at a discount, are potential buy candidates. Conversely, individual CEFs that have undergone a significant increase in premium/discount value in the past week, coupled optionally with a decreasing NAV trend, a positive z-score, and/or are trading at a premium, are potential sell candidates. December 6, 2018 |Nuveen Taxable Municipal Income Fund Announces Final Results of Tender Offer. The Nuveen Taxable Municipal Income Fund (NYSE: NBB) announced the final results of the tender offer it conducted for a portion of its common shares. As previously announced, the fund conducted a tender offer for up to 20 percent of its outstanding common shares for cash at a price per share equal to 100 percent of the net asset value per share determined on the date the tender offer expired. The price that shareholders will receive will be net of a repurchase fee of $0.0261 per share. The tender offer expired on February 12, 2019 at 5:00 p.m. Eastern time and was oversubscribed. Due to the fact that the number of shares tendered exceeded the number of shares of the fund offered for purchase, the fund will purchase the maximum percentage of its respective outstanding common shares on a pro-rata basis in accordance with the number of shares duly tendered by each shareholder and the terms of the offer to purchase. January 7, 2019 | Morgan Stanley Emerging Markets Fund, Inc. Announces Approval of Reorganization. Morgan Stanley Emerging Markets Fund, Inc. (NYSE: MSF) (the "Fund") is pleased to announce that its stockholders, at the Fund's Special Meeting of Stockholders held on January 7, 2019, approved the reorganization (the "Reorganization") of the Fund into the Emerging Markets Portfolio ("MSIF Emerging Markets"). MSIF Emerging Markets is a diversified series of Morgan Stanley Institutional Fund, Inc., an open-end management investment company advised by the Fund's investment adviser. In connection with the Reorganization, stockholders of the Fund will receive newly issued Class I shares of MSIF Emerging Markets with a value equal to the aggregate net asset value of their common shares of the Fund on the valuation date, which is expected to be the close of business on or about February 22, 2019. The transaction is currently expected to close on or about February 25, 2019, subject to the satisfaction of certain conditions. Stockholders of the Fund will continue to be able to trade their common shares of the Fund on the New York Stock Exchange until the close of business on or about February 22, 2019. Subsequently, the Fund will cease trading on the New York Stock Exchange and will be dissolved. December 6, 2018 | Morgan Stanley Asia-Pacific Fund, Inc. Announces Reorganization into Morgan Stanley Institutional Fund, Inc. - Emerging Markets Portfolio. Morgan Stanley Asia-Pacific Fund, Inc. (NYSE: APF) (the "Fund") announced that, after considering the recommendation of the Fund's investment adviser, Morgan Stanley Investment Management Inc., the Board of Directors of the Fund determined that it would be in the best interest of stockholders of the Fund to approve an Agreement and Plan of Reorganization by and between the Fund and Morgan Stanley Institutional Fund, Inc., on behalf of its series Emerging Markets Portfolio ("MSIF Emerging Markets"), pursuant to which substantially all of the assets and liabilities of the Fund would be transferred to MSIF Emerging Markets and stockholders of the Fund would become stockholders of MSIF Emerging Markets, receiving shares of common stock of MSIF Emerging Markets equal to the value of their holdings in the Fund (the "Reorganization"). The Reorganization of the Fund will be submitted for stockholder approval at a special meeting of stockholders (the "Meeting") scheduled to be held on March 8, 2019, and any adjournments or postponements thereof, to stockholders of record on January 14, 2019. Further information about the Reorganization will be included in a proxy statement/prospectus expected to be mailed to stockholders in the first quarter of 2019. February 8, 2019 | Eaton Vance Tax-Advantaged Bond and Option Strategies Fund Implements Changes to Fund Name, Investment Objective, Fees and Distributions. Effective today, Eaton Vance Tax-Advantaged Bond and Option Strategies Fund (NYSE: EXD) (the "Fund") is implementing changes to its name, investment objective and investment policies as described below. The changes were previously announced in November. Name. The Fund's name will change to "Eaton Vance Buy-Write Strategies Fund." It will continue to be listed on the New York Stock Exchange under the ticker symbol "EXD." Investment Objectives. As revised, the Fund will have a primary objective to provide current income and gains, with a secondary objective of capital appreciation. In pursuing its investment objectives, the Fund will evaluate returns on an after-tax basis, seeking to minimize and defer shareholder federal income taxes. The Fund's current investment objective is tax-advantaged income and gains. Investment Policies. Pursuant to its revised investment policies, the Fund's strategy will consist of owning a diversified portfolio of common stocks and selling covered index call options (a "buy-write strategy"). Under normal market conditions, the Fund's investment program will consist primarily of (1) owning a diversified portfolio of common stocks, a segment of which ("Segment One") seeks to exceed the total return performance of the S&P 500 Composite Stock Price Index® (the "S&P 500") and a segment of which ("Segment Two") seeks to exceed the total return performance of the NASDAQ 100 Index® (the "NASDAQ 100") and (2) selling on a continuous basis S&P 500 call options on at least 80% of the value of Segment One and NASDAQ 100 call options on at least 80% of the value of Segment Two. Initially, approximately 50% to 75% of the Fund's net assets will be invested in Segment One and the balance will be invested in Segment Two. Although the Fund will designate separate S&P 500 and NASDAQ 100 segments, the Fund's stock portfolio will be managed on an integrated basis. Over time, the percentages of the Fund's stock portfolio invested in each Segment may vary based on the investment adviser's evaluation of equity market conditions and other factors. Due to tax considerations, the Fund intends to limit the overlap between its stock portfolio holdings (and any subset thereof) and each of the S&P 500 and the NASDAQ 100 to less than 70% on an ongoing basis. The Fund's stock holdings may include stocks not included in either index. The Fund will seek to generate current earnings in part by employing an options strategy of writing (selling) index call options on the S&P 500 and the NASDAQ 100. Under normal market conditions, the Fund expects to sell on a continuous basis S&P 500 call options on at least 80% of the value of Segment One and NASDAQ 100 call options on at least 80% of the value of Segment Two. Under normal market conditions, at least 80% of the value of the Fund's total assets will be subject to written index call options. Writing index call options involves a tradeoff between the option premiums received and reduced participation in potential future stock price appreciation of the Fund's portfolio of common stocks. These are sorted in ascending order of distribution change percentage. Funds with distribution changes announced this month are included. Any distribution declarations made this week are in bold. 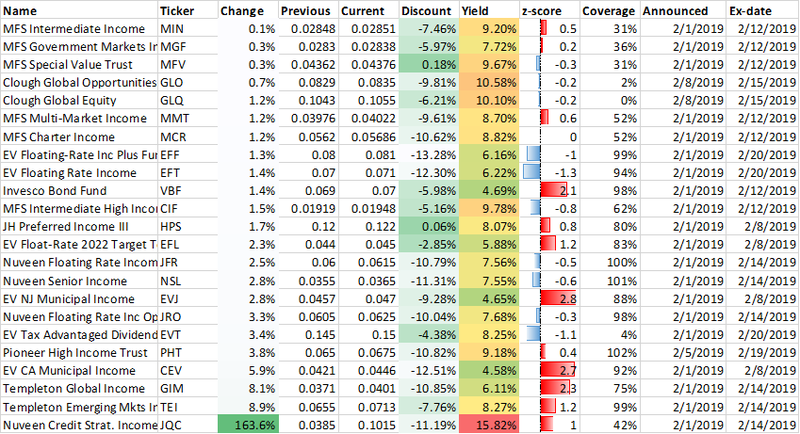 I've also added monthly/quarterly information as well as yield, coverage (after the boost/cut), discount and 1-year z-score information. I've separated the funds into two sub-categories, cutters and boosters. *To subscribers: these link to the public version of the article, which you will already have seen in the members section. We're currently offering a limited time only free trial for the CEF/ETF Income Laboratory with a 20% discount for first-time subscribers. Members receive an early look at all public content together with exclusive and actionable commentary on specific funds. We also offer managed closed-end fund ((CEF)) and exchange-traded fund (ETF) portfolios targeting ~8% yield. Also, check out our 5-star member reviews. Disclosure: I am/we are long THE PORTFOLIOS. I wrote this article myself, and it expresses my own opinions. I am not receiving compensation for it (other than from Seeking Alpha). I have no business relationship with any company whose stock is mentioned in this article.